One more month, and one more bit of assembling going on for my OpenROV #63: this time I assembled the ESCs on the echassis and connected all their wires to the molex connector. first problem is that I didn’t buy the ESC suggested and that come with the kit, but I bought a similar ESC that was on promotion at the moment of buying, and which had to be exactly the same size. Unfortunately it was not: it was just 1-2mm wider but enough for the central ESC not to fit in its lodgement: so I had to dremel out the walls of the dividers. The Molex connector doesn’t clip in place (this is a known problem) since the gap between the clip and the blockers is 2mm while the thickness of the wall is 3mm: that required more dremeling. And finally, it was a big pain to crimp all those molex pins on top of the wires: I had a kind of crimping tool, but probably it was made for other types of molex pins and it did an awful job that at the end I decided to do it manually with normal pliers. But given the amount of molex crimping needed in the future (still power leads and tether on the ROV side and all the ESCs, power and tether on the cable side) I think I’ll go and buy a molext crimping tool. But at the end everything came out pretty nice and tidy. 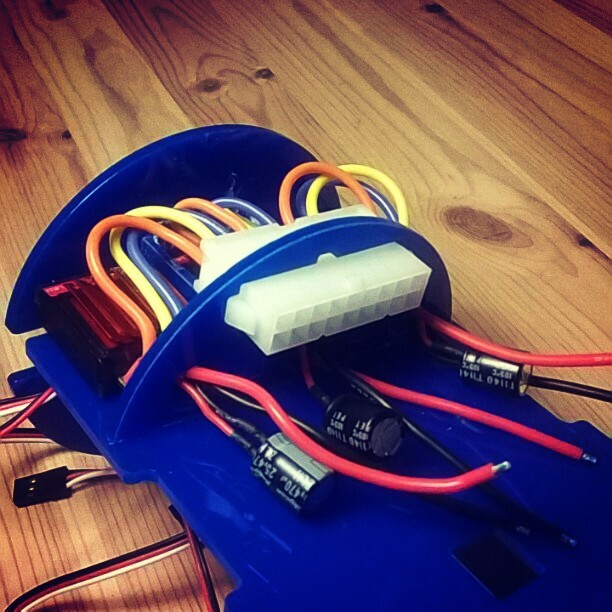 This entry was posted on October 25, 2013 by simonech in OpenROV and tagged electronics, ESC, molex, OpenROV.